In the early 2000s, David Newman founded Audiobulb, a label which has since been a catalyst for contemporary electro-acoustic works and sound-based projects involving a wide range of artists. 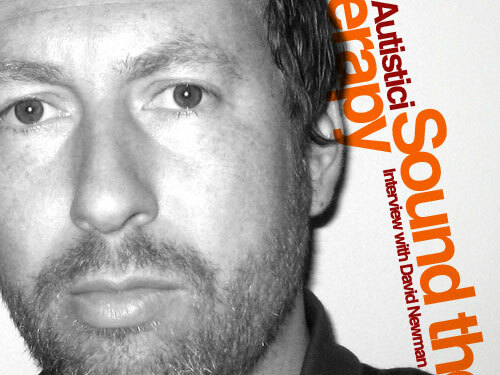 Two years ago, Newman released his debut album as Autistici, a project which he had started working on in 2000. We took the opportunity of the release of Detached Metal Voice – Early Works (Vol. 1), a collection of early material released on Audiobulb, to catch up with him and talk about both his music project and his label. You’ve just released a collection of early recordings under your Autistici alias. On the record, there is no indication of when these tracks were recorded. Were these recorded over a long period of time? Hello themilkfactory and thanks for the opportunity of this interview. The tracks on Detached Metal Voice – Early Works (Vol . 1) bring together my work from 2000-2003. This period of time represents the early days of Autistici. The album is described as ‘a collection of early works exploring the raw extrusion of the human condition’. Was it a concept you were working on at the time, and how did you try to transcribe this concept into the music? There is always context, the interplay between the external world and the internal psyche. There is definitely a sense of struggle with the human condition. In my work as a Clinical Psychologist I have to process the experience of people. Often the innate drive to develop, thrive, to reach out and connect with others has been damaged by experiences of abuse of trust and power. Sometimes part of surviving psychologically can involve disconnection from other people and from the self. Walls go up and the world is experienced in a different manner, detached, depersonalised and dissociated states predominate. This is a difficult place to be and as a therapist it is difficult to process. Issues of my own vulnerability and sense of self and the world are impacted upon. However I am supported positively through my own clinical supervision and the task of processing the difficult material is addressed there. However I needed another avenue to record residual aspects of my experience. Autistici gave me a chance to reprocess non-verbal elements of my world through the creation of abstract sound narratives. While your first two albums had quite a pastoral feel, especially your first, Volume Objects, the music featured on this album is quite different, more varied in style and also darker, with harsher electronic sounds. Was it a conscious effort on your part to collects these on one record to showcase a different side of your work, and is this still relevant to the music you make today? Detached Metal Voice – Early Works (Vol. 1) represents the work that went before Volume Objects which was recorded 2007-2009. It is more visceral and raw – dealing with a darker part of me at a particular point in my life. The process of the recordings was less planned and more organic. The process was one of emptying and catharsis. This is volume 1. Do you have a lot more unreleased material lined up for release? Yes, Slow Temperature – Early Works (Vol. 2) will be released later this year. It contains music predominately from 2001-2005 but the collection is more ambient and less harsh. It is a bridge to the works created for Volume Objects. How did Autistici start? Was it your first project? Autistici started at the point I could afford my own studio equipment and work on music again. Prior to this I had recorded works under different alias in the late 1980s and early nineties. At that point bands such as The Orb were a big influence of my work and I was making more commercial electronic dance music. However I could not afford my own equipment and had to save to get the cheap night time studio sessions. Writing music and doing the final mix as the sun came up and the dawn chorus rang in. In an interview you gave to Textura a couple of years ago, you talked about the origin of Autistici and said that it ‘acknowledges the part of you that has an obsessive preoccupation with sound’, and you went on to mention people who have Autistic Spectrum Disorder, which manifests itself by problems to communicate or interact with others. How did you come to choose a name that highlights quite a serious disorder? Autistic Spectrum Disorders (ASD) represent a range of developmental disorders that tend to affect people’s ability to participate in and understand social communication and perspective taking. Alongside these difficulties there are often areas of relative strengths as people may focus on particular interests in an intense manner. Hyposensitivity to external stimuli can mean that the world is experienced in a qualitatively different way. For example, sounds can be amplified, tastes distorted, visual stimuli become overwhelming and pain thresholds can be substantially higher or lower. I have met many people with ASD and each one has their own unique and valid take on the world. To me it is not a “disorder” a medical term, it is simply a difficult difference but one we should all respect and value. Furthermore, ASD is a continuum condition and in that respect we are all on the continuum. The name started as a two word name as in “Autistic I”, an acknowledgement of my own intense preoccupation with sound and my own sensitivity to environmental audio stimuli. When I bought the domain name I realised it was easier to have a single word name and Autistic I became Autistici. Volume Objects was published on Taylor Deupree’s 12k in 2008. How did you get to work with him? Volume Objects was the result of an initial approach to Richard Chartier (12k/Line) whom I met following a performance of his work in Sheffield. He had been playing a set of beautiful minimal tones in an old warehouse building in the centre of Sheffield. I gave him a copy of my music and invited him to listen. Richard emailed soon after and told me that my sound could be suitable for 12k. The next stage was contact with Taylor Deupree. Taylor was interested in working with new artists and expanding the 12k repertoire. Blueprints featured two tracks from the artists Christmas Decorations, Seaworthy, Jodi Cave, Pjusk, Leo Abrahams and Autistici. The compilation was well received and gave Taylor and myself a platform to discuss a full release. The next stage was working with Taylor to bring together a coherent album that worked for 12k and worked for me. Taylor and myself honed down Volume Objects paying attention to the flow, the diversity and the coherence of the track listing. Last year, your second album, Complex Tone Test, was published on Kesh Recordings, the label set up by Simon Scott. Did you know him prior to this? Simon found my work via my myspace page and we started talking about the release from there. It was great to work with Simon whom I met in person for the first time this year. These two albums, while sharing some common grounds, are quite different. How did they come together? Did you have a particular plan for each one of them, or are they more collections of tracks in a particular vein recorded over a long period of time? Complex Tone Test contains some tracks that would fit with the 12k aesthetic, however it also contains tracks with rhythm elements and distorted electronics more fitting to the Kesh style. I am always recording music and I treat each track as a separate entity. I am not concerned to stay within a particular style or genre. This means I have a collection of works of varying styles. The common element is that I am the creator and I have my own ideas regarding what narratives and structures I pursue. However when it comes to releasing an album it is important to create a macro narrative. This forms the ebb and flow of the album and influences the listening experience. Just as track after track of soft ambience may send a listener into a dissociated sleepy state, track after track of full on harsh noise may send the listener into a dissociated irritated or over aroused state. In my view it is good to have albums that build and occupy space and then fall away and provide space. It is the extremes of the experience that support the listener to focus on the impact of the audio. You have been running your own label, Audiobulb, since 2003. What made you decide to start the label, and looking back at your catalogue, have you achieved what you set out to? I started the label out of deep respect for the work of unreleased artists whom I believed I could support through media exposure. Not all of them are active now – but artists such as Erik Schoster (He Can Jog), Simon Kealoha (Calika), Henry Leo Duclos, Build, Disastrato, Claudia and Marion all had such a great creative aesthetic. I am also very interested in design, marketing, PR and establishing a brand on the internet. I wondered to myself, “this new social sphere – what happens if you walk out and use its tools and systems – how far can I take it?” If you are asking me whether I have achieved what I set out to achieve in 2003, then the answer is a resounding yes. However my ideas and aspirations continually evolve and develop. I am always looking to achieve new opportunities on behalf of the label for its artists. I believe in the people and their work. I want them to reach all the audience that could be open to them. Right from the start, you have released both digital-only and traditional CD releases, at a time where digital formats were still a novelty. Could you feel at the time that they would become so predominantly in such a short period of time? Yes. As older established labels struggled to come to terms with the shifting market conditions Audiobulb was new and flexible. It took a couple of years to get a good handle on the state of play and conditions are always changing but I think a combination of digital and where there is demand physical CDs is the way to go. The physical digital evolution is ongoing and I believe that very soon everyone will be buying wav quality digital releases as their download speeds and hardware capacities improve. I believe the electronic equipment companies will move toward higher definition CDs (24 or 32 bit). This will continue the pressure on consumers to upgrade and update and will provide them with a new market to tap (just like the impact of blue ray/ HD television images). I for one am hoping for 32 bit audio, people will argue against it and point to limitations in human hearing but I can hear the difference. At the end of the day we all have different acoustic perception. As a consumer of music, are you more of a vinyl, CD or MP3 type of person? I love the quality and warmth of vinyl. I adore the subtle crackle of the needle on the record. If you visit the Audiobulb webpage that sound is there – all the time built into the experience. However, with vinyl you have to flip the record halfway through the album, I do not like the interruption of flow to my listening experience. I am more of a CD person and like to listen through high quality systems. I do use MP3s, I bought my first iPod four months ago but MP3s encoded at 128 get me down – FLAC is a better option. The music you’ve released over the years has been quite varied, although there is definitely an emphasis on electro-acoustic work. How do you choose to release a particular record, and how do you decide between traditional CD and all digital release formats? Quality and artistic vision are the guiding principles for all the releases on Audiobulb. Some of the releases showcase the work of one artist but many are works by a group – the “various”. I am deeply interested in how different artists approach a single idea or project and it excites me to hear how unique each approach is and the final pieces of music that emerge. I have always been a fan of remixes particularly of electronic music. I think projects such as the current :Papercutz album, the Favourite Places series, Birmingham Sound Matter and the Exhibition series all illustrate Audiobulb’s interest in exploring conceptual similarities and difference. Projects such as these also allow you to work with a range of inspirational artists, in recent years Biosphere, Taylor Deupree, Helios, Simon Scott, Jeremy Bible, Leafcutter John and Icarus and many more have all contributed to this exploration of the modern composer. In terms of decisions regarding CD and digital versus digital only – that is purely a question of economics and demand. Artists such as Ultre, He Can Jog and Jimmy Behan can create enough demand to warrant a CD run. Other releases or artists may produce work that is unlikely to sell a minimum number of CDs and so we release in the digital domain. However, regardless of the format all releases represent quality beautiful works that deserves to be heard. Record labels have a pretty tough time at the moment, and have had for a few years now. How do you manage to keep your head above the water and continue to release music regularly? I’m committed to what I do and continue to feel excited, challenged and motivated by running the label. I enjoy the learning about the market and how to operate the label in a manner that maintains its aesthetic quality and financial stability. A lot of graft is required to ensure the PR process is sufficient and the information about the music is out there. At the end of the day it is good to be able to pay artists for what they do. It is a return; a recognition and reward for all their hard work. Why have you waited so long to release your own music on Audiobulb? I had to undergo a process. I write because I need to. I do wonder how the sound would be perceived by others but I do not expect others to want to engage with my work. I needed to undergo a process of peer review. I needed to put my music into the hands of other label owners who did not know me. I was looking to receive an unbiased reaction to my work from my peers. I now feel confident enough to release some works on my own label. However, I will always look to work with other people – simply because if they are releasing my music I am freed up to release the music of other artists working with Audiobulb. This year there will three releases featuring Autistici work. These include the two Early Works (Vol . 1 & 2) and a remix album called Resonating Wires which will feature reconstructions of the Resonating Wire track taken from Complex Tone Test. The album contains outstanding and diverse works from artists such as Francisco López, Richard Chartier, Jimmy Behan, Isan, Claudia, He Can Jog, Ian Hawgood & Danny Norbury, Simon Scott, Bluermutt & Sawako. What I love about this release is the fact that a single track can provoke artists to reinterpret the material so differently – from extreme minimalism to abstract concrete sounds to orchestration to dance. How did the Favourite Places project, which is based on artists providing music relating to a particular place they like, come up, and how did you get them involved? As I’ve indicated, I have always enjoyed working around projects and concepts. Audiobulb has a dedicated project page where the Root Of Sine and Endless Endless projects run. Favourite Places continues in the same vein. It gives artists a direction to place themselves in a particular psycho-audio environment in order to capture and create. I really liked the comprehensive nature of the project. The fact we could record time, place (latitude and longitude), visual imprints, audio imprints, subjective text, and creative musical interpretations all defining one place from one person’s point of view. In terms of getting people on board it was a case of using connections and talking to the artists. They believed I could deliver and they were happy to be involved. I am extremely proud of all that has been achieved via the Favourite Places project, I think it really works well. The project was made even more robust by the unique hand finished design concept for the CD created by the wonderful guys Stereographic and by the interactive website created by my brother Andrew Newman. There have been two instalments of Favourite Places so far. Are you working on a third one? I am not actively working on a third one. I think the first two instalments need time to breathe and be found by listeners. However when the time and people are right it could well happen. How do you see the label evolve in the next few years? Is there anyone you would like to release the music of? I like to support the label to evolve in an organic fashion. I see myself as a curator, someone who has a degree of vision and who can steer a course. But I have to let myself be influenced by what I come into contact with on a day to day basis. New artists or new works by people I have already worked with. Some of that is out of my hands. I would love to release further albums by Ultre, He Can Jog and Jimmy Behan. I am allowing Audiobulb to become more diverse, to work with bands such as :Papercutz and The Hole Punch Generation and to release tracks that are songs! My passion and interests still remain in the electro-acoustic crossover of sounds from minimal ambience to quirky off centre beats characterised by the work of artists such as Calika. Only time will tell, there is no place for rigidity in today’s market. Last but not least, if you had to name five records, books, films or works of art, which one would you choose, and why? I live in the world of sound. I would choose five records that live in my psyche and have shaped my experience of myself and the world. I would then realise that five would not be enough and the need to hone down the list would stress me out! Thanks for the interview and best wishes with the excellent Milk Factory.